Leaving the hospital with my father-in-law just now, we shared an elevator down with an evangelical/Bible Church preacher. I’ve done enough hospital visits over twenty years to be able to pick them out. He was a short man. A foot shorter than me. Stocky. Built like an NFL linebacker. How did I know he was an evangelical/Bible Church preacher? Cheap suit, but impeccable tie and shirt. Slicked back hair. Incredibly good looking shoes. But most of all, his Bible. A huge, thick, immense Bible. Gold-leaf pages. Imitation leather cover. He was carrying it like Robert Newhouse carried the football; tucked firmly under his forearm, like at any moment he would take off down the halls, stiff-arming opposition in his way. Or…like it was a weapon. Which, I sensed in those few seconds, he believes it to be. But today, I was in the uniform of a hospital patient son-in-law. So I didn’t acknowledge him. I just watched. 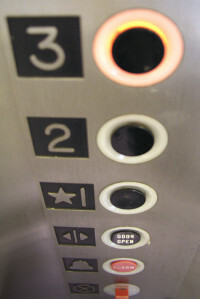 He didn’t acknowledge us either, so tense and tightly wound was he; so impervious to the sick and wounded all around him, so ready for the elevator door to open so that he could parade down that hall toward the parking lot. Which, if you know the original story means, of course, that actually I am.